The ever increasing number of electronic devices and technologies in our every day lives is making it more and more difficult to spend quality time with ourselves and loved ones. A once relaxing experience is proving to be a challenge. “One Remote Control Integration” by Control4 simplifies things and makes use of technologies more convenient, by enabling seamless integration of multiple devices as intelligently as you want them to be. Control virtually any device in your home – from TVs, Blurays and multiroom audio to lights, thermostats, door locks, shutters, alarm systems etc. – through a single, portable, easy-to-use interface. Limited only by your imagination, everything you’d like to control in your home can be integrated in this affordable remote control from Control4. What Can I Do With One Remote ? 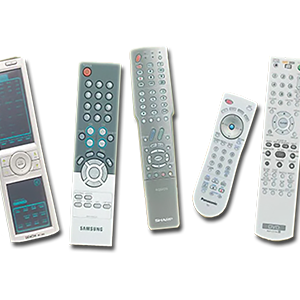 Replace all the clutter from different remote controls with a single powerful device that does it all. Replace all coffee table remotes with one that controls all your equipment, with all the functions a remote can have. Access your music and movie library, control the lights, temperature, shades, locks, house appliances and much more. The remote everyone loves just got better. 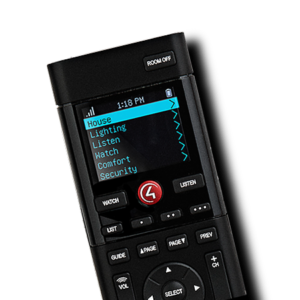 The new Control4 remote is the perfect hand-held interface for your entire home and is now even more intuitive, more customizable and remarkably faster. Is It Easy To Install And Use It ? No need to point your IR devices any longer. The remote control operates on Zigbee wireless protocol, making control of your equipment fast & easier than ever before. Pause or rewind without taking your eyes off the screen, with buttons arranged to give you a more intuitive, one-handed experience. 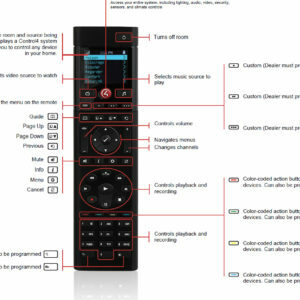 New custom buttons along the top of the remote can be programmed to any event or activity throughout the home. The built-in screen gives you the interface for your whole-home automation, and is available in many languages, including French, Czech, Chinese, German and more. Need an extra remote for another room? Just add it to your Zigbee network and the remote will automatically learn all the devices in the house and set its default settings for the new room. How Do I Combine It With The Other Solutions ? Use your smart remote control to switch & dim the lights. Activate your favorite lighting scenes. Open or close the shutters or blinds using your remote. Close the curtains to watch your favorite movie. Arm, Disarm and Check the status of your security system. Check the status of your doors and windows. Check that status of any sensors around the house like presence in the rooms, humidity, tank levels etc. Lock or unlock the main entrance. Select the ‘Listen’ menu, navigate through your music library or online streaming services and listen to your music in any room of your choice. Select the ‘Watch’ menu, browse through your movie library or online streaming services and watch a movie in any TV or your home cinema. Turn on your heating and set the temperature to the desired set-point. Easily control your outdoor lights. Switch on or off any connected household appliances. Keep a track of your energy consumption. Dim or switch off lights in other rooms to save on energy costs. 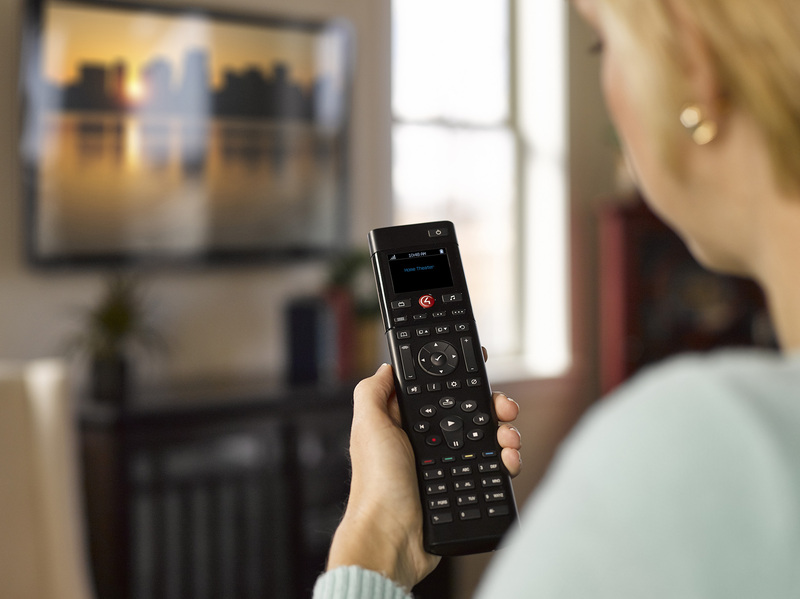 Customize your remote buttons to any event or activity throughout the home. Integrate any IoT device and control it with your remote.